We have been fortunate to receive the love and trust of our customers at every stage of our journey. But November 2017 decided to make Thanksgiving extra-special as we wrap the month with three wonderful accolades on very prestigious platforms. London Business School in collaboration with Management Today felicitated Ritesh with Real Innovation Award. Ritesh won in the ‘If At First You Don’t Succeed’ category – sweeping both the People’s choice vote and the jury award. The Ministry of Skill Development and Entrepreneurship awarded OYO the National Entrepreneurship Award 2017 in the hospitality category, in recognition of the work done by the company to create affordable, high-quality accommodation for travellers in the country. We rounded off the month with a validation of the work done by our Customer Service teams and specialists as OYO won the CX Innovation of the Year Award at Quest Customer Experience Awards. 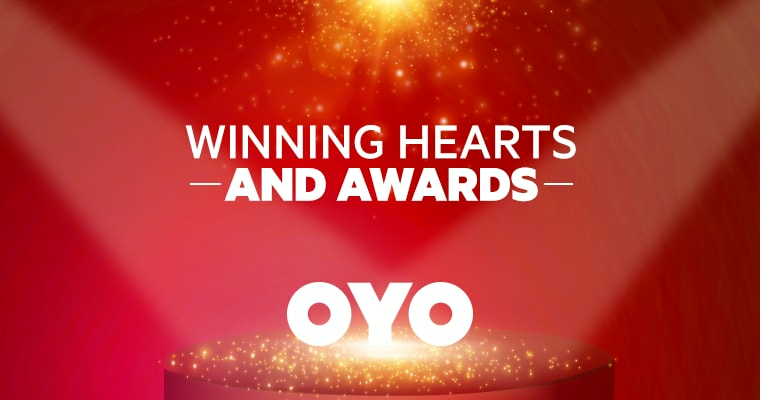 OYO’s service innovations recognized by customer-service experts included OYO Captain and Kryton app – both of which helped enhance on-ground experience and raise service scores. These awards are a testament to the effort put in by each of our team members and we dedicate these wins to our fellow-colleagues. What started as a single hotel in Gurgaon four years ago is today India’s largest hospitality company. We stay motivated to changing the way people stay away from home – one experience at a time. Starting 2018 on a high note!